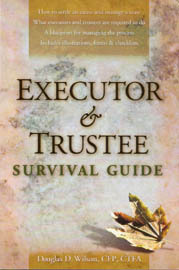 An invaluable reference book that describes in detail how to settle an estate and manage a trust. Available NOW. See Ordering your copy to view and print a 3-color brochure that contains the order form. Copyright© 2000-2007 by Fiduciary Publishing. All rights reserved.